If you’re looking for a way to give your home a touch of elegance that requires very little maintenance, then you should consider our ceramic tile flooring in Appleton, WI. It comes in a variety of colors, styles, and textures, which makes it versatile enough to match any décor. Ceramic tile is also known for being one of the most durable flooring options, so you can depend on its longevity to withstand the pressure of your home’s high-traffic areas. At our showroom, we feature exciting tile options from the industry’s most trusted brands, including American Olean, Daltile, and Floorcraft. When you’re ready to upgrade your home’s flooring, ceramic tile has the durability and classic elegance that will give your floors fresh style for many years to come. Cherished by many cultures throughout the ages for its sturdiness and beauty, tile is available in many styles to boost whatever your interior design preference may be. This kind of flooring is a guaranteed way to optimize your floor’s aesthetics while minimizing the time and effort involved in its upkeep. When deciding which type of flooring is best for your home, maintenance is one of the most significant factors to consider. A ceramic tile floor features one of the lowest-maintenance surfaces, which can be sufficiently cleaned with soap and water in the event of any spill. While other flooring materials are easily damaged by pet accidents, water stains, or food spills, ceramic is stain-resistant. After we consult with you to discuss the benefits and financial aspects involved with tile, we help you choose which color, size, pattern, and style will work best for your home. Unlike other flooring, these floors can be alternated with other sizes and types of tile to create intricate geometric designs. Count on us for ceramic tile flooring installation provided by experienced flooring professionals who have the expertise and tools necessary to make your home look its best from the ground up. Our professionals are dedicated to providing you with quality service at every step of the process, so we make certain that our flooring installation is convenient for you from start to finish. Once you’ve selected which gorgeous variety of ceramic flooring best matches your decorating needs, our experienced installers take care of the rest. Our store makes flooring easy by giving you the most efficient and reliable installation around. Installing ceramic tile is a demanding job that requires professional skill, and our team has the knowledge to deliver the prompt results you want. Depend on us to lay down your exceptional new ceramic tiles. Our team makes sure your floor is installed correctly for a lifetime of exceptional flooring beauty. When your project calls for a tile floor, come to us for our superior service. We work with you to learn about any ideas you have in mind for your home’s visual aesthetic, and use our extensive background in the flooring industry to provide you with any suggestions that will enhance the design of your new floor. Whether you’re looking for a pattern that provides a sharp contrast with your décor or a simple, timeless design, we help to make your flooring dreams become a reality from conception to completion. The best part about your floor is that its design is completely up to you. We provide a wide range of tiles in a variety of textures, sizes, colors, and designs that can be combined with one another for a one-of-a-kind design that gives your home a fresh and unique look. Choose from our broad selection of ceramic tile floor styles to rejuvenate your home from the ground up. After we measure the area where your new flooring will be installed, we carefully plan for the remainder of the process to ensure that your new tile floor is installed properly and efficiently. When you decide on ceramic tiles for your home, make sure that you visit us for help from the flooring professionals. We are dedicated to making your floors look their best and take pride in delivering superior results from start to finish. 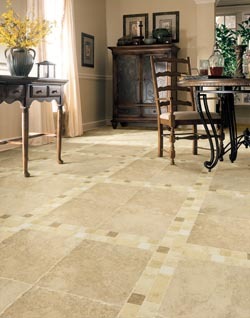 A tile floor made of ceramic is the versatile choice for any room in your home. Tough, practical ceramic won’t easily scratch or chip, so its stunning appearance holds up in even the busiest households. The various glazing and finishing options available for this flooring means that you have an abundance of design options choose from. Whether you want the authentic look of marble or granite, ceramic offers you the same natural-looking beauty at a substantially lower price. All of our stunning tile options provide the same easy-to-clean durability, and our design experts are available to help match you with the tiles that best suit your home design goals. From subdued colors to bold designs and everything in between, our tile options are sure to boost your home’s décor with lasting beauty. The sophistication and luxury that come with tile floors don’t fade over time, and with routine maintenance, your floors will look just as good years from now. If you’re ready to add value to your property with this classic material that transcends both contemporary and traditional styles, visit our showroom. Our associates are standing by to guide you to the right ceramic tile for you. Contact us when you’re looking for ceramic tile flooring for your home. We serve clients in Appleton, Wisconsin, and the surrounding areas.